Editor's note: this report was aired on the Kaliber radio show, an investigative journalism program on Swedish Radio. Parts 1 and 2 were translated exclusively for AINA by Cristina Chamoun. Four million people are on the flight from Iraq. When the surrounding world closes its borders, illegal escape routes are the only things offered. Kaliber follows the desperate traffic -- towards the attaining goal: Sweden. Here you can take part of Nuri Kino and Marie-Jeanette L�en's report of a billion dollar industry, where networks of smugglers take people here on dangerous ways from Iraq -- in exchange for big money. All refugees we have met live under pressure and threats. Their names are therefore changed, and the details of where we have met are sometimes altered in order to avoid identification. The humanitarian tragedy in Iraq truly knocks on Sweden's door. 70 times a day, according to Swedish authorities. That is how many illegally smuggled refugees from Iraq come here -- every day. For nowadays Sweden is one of the very few countries where there is a possibility whatsoever for the Iraqi refugees to stay. Our report begins in the Syrian capital Damascus. 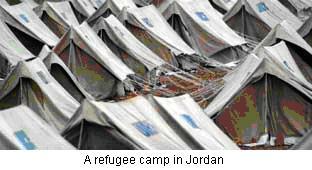 Because there -- and to the neighbouring country Jordan -- it has so far been able to come legally. But when the population there drastically increases the living conditions become more and more intolerable. The Iraqi are "pressed out" from their first stop. It is at this point they get caught up in the smugglers' toils. In the crowd in Damascus we meet Mikhael. "Sweden, he says, I want to go there. I have heard about Sweden. I know that it will be difficult for me because the language is different. I really want to go to Great Britain, but I cannot have my rights there. It is not as in Sweden. I have heard that in Sweden they take care of people and of refugees. So I hope to get there." Mikhael is around thirty -- a tough guy -- but terrified, because he is a Christian Assyrian, and because he used to work for the Americans back home in Iraq. A fact that is looked upon with disapproval by everyone. We will follow him and his way from Iraq to Sweden. Because he is one of tens of thousands with the same goal. Here in the streets of Damascus everybody knows of cities such as S�t�e, J�ping and Boden. Every other person we meet has a relative or an acquaintance who has moved north with help from smugglers of human beings. It feels like the chartering business. There are numerous travel agents everywhere -- by the telephone card salesman, at the internet caf�r in the cigarette store -- everybody knows about the smugglers, everybody knows whom to talk to. But everybody is careful. They are well aware of the fact that the smugglers are dangerous to deal with. We are talking about heavy criminals, and some also deal with weapons and narcotics; and there is a lot of money involved. We are being warned of snooping about. Iraq's neighbouring countries Syria and Jordan are the countries that have received most of the millions of Iraqis who are fleeing the violence in their native country. What has forced away the Iraqis is obvious. An Iraqi woman who has fled from her home town tells us. "If someone could describe what it is like to live in hell you would understand, than the world would understand what it is like to live in Baghdad. Every time somebody goes out you wonder if he or she will return. Every time a girl goes out you do not know if she will return or if she will be abducted, raped or murdered. It is like in hell." So far Syria has received the Iraqis, but now they have started to have a reserved attitude. That increases the pressure for the refugees -- they want to move forward. The United States of America does not receive them, and neither do most of the countries in the European Union. Only in Sweden and in the Netherlands they might be allowed to stay. But in order to get here, for most of the refugees, means travelling illegally. Two of which who know what this journey is like are Ninip and Leyla. We meet them just as they have arrived at final destination -- after the last part, by train from Copenhagen to Gothenburg. "If I knew that the way would be so difficult, Ninip says, I would never have had taken this way. I might as well have got killed home in Iraq." Leyla and Ninip made it all the way -- but they were beaten on the way and feared for their lives. Their story is fairly typical. We can certify that after reading a series of preliminary investigations, reports from Europol, Interpol, and the UN border agency Frontex, spoken to the Swedish Migration Board, the UN refugee agency, and police officers, been to trials and talked to numerous people who have been smuggled and are trying to make it to Sweden. There is a clear picture. This year alone over 20,000 Iraqis will come to Sweden -- most of them with the help of smugglers, according to Swedish and European police. Around 70 people come here illegally -- every day. Since every smuggling usually costs around 12-15,000 dollars, the business turnover is around 2 billion Swedish crowns this year. To Ninip and Leyla, the whole trip to Sweden cost 30,000 dollars in total, a bit more than 200,000 crowns -- but then food and accommodation along the road was at their own expense. The criminal offence of smuggling of human beings is not given a high priority to by the Swedish police. The punishments are usually very light. Most of the work of the police is not co-ordinated over the country. But during the work of Kaliber, it becomes apparent that 30 to 35 loosely put together smuggling networks work from within Sweden. They buy the services they need on the spot: someone driving between Turkey and Greece; someone who can forge different types of passports and identifications; someone working at the airport in Athens, Milan, Munich or Paris, and who can get into the transit hall with new tickets and passports. Hans Lippens is head of the border police in V�ra G�and. "There are at least 30 different organizations that actively work with smuggling of human beings here, and in the first place it is about Iraqis." When you make a swoop on them, what happens next? Do they vanish, or do they remain? "No, they remain. There will be a short interruption for maximum a week, and then they are back in business. Even if we arrest and imprison people, the organizations continue via other contacts and other networks. So it just continues all the time." So, it never really ends? We have had contact with several smugglers, but none of them is ready to face us -- in private. Everyone is very suspicious and afraid of getting caught. Finally one man agrees to meet us at a caf�n Stockholm. He works for a gang with many co-workers all over the world. We claim to need help to get an Iraqi relative out from Mosul. The man we meet at the caf�eems to be on pins and needles, and does not want to take his jacket off. When he gets there, shall he call one of your friends? And then you will give me a number? "Yes, then you will be given a number." And how quickly can you get him here to Sweden? "Yes, that depends, but it will work, like that� You can't tell, nowadays it has become a bit harder to get to Europe. But we have our route, so it's no problem. It will be taken care of." I'm a bit nervous, this is illegal, isn't it? "Yes, but it is� well� all the people who have come here, maybe twenty, thirty thousand, and it� well� everybody come on that way. There is no other way. You can choose yourself. I cannot wait for him so long, because we have other people� coming." In Damascus we meet Mikhael yet again. He is waiting for information about how the trip will be arranged. He has come up with the money by selling everything that he owned and had. To him -- as to most others -- there is no way back. When we meet him again he has just had contact with yet another smuggler who transports people between Turkey and Greece, hidden in an UN truck. -- That is where Mikhael will be hidden in a large wooden box together with 8 others. He said that I have to pay him seven thousand dollars for it, and he said that he only takes seven to eight people every time. They will put them in a box, cover it, and make a small hole in the box in order to let air in so that one can breathe. Then they will put the box in the middle of the truck. Even if they stop the truck they would not discover the box, since it is in the middle of the truck platform. It is a truck which will bring things for the UN, from Turkey to Greece, and from Greece to Turkey. Do you know anyone else who has made it out that way? "Yes, my cousin made it to Athens the same way, ten days ago, with a UN truck." Mikael will travel from Syria to Sweden via Turkey, as will most the others, because from Turkey the old smuggling road still via Greece and further into Europ�nd countires of the Schengen Agreement. The methods are numerous: by foot at night, by rubber boat, small high speed boats, or by car, or by truck. It all depends on luck and how much you can pay. A man we met our first night in Damascus has decided to bring all his family with him on the journey. He does not dare to leave his wife and his children -- three and five years old. He has already bought the trip -- they will climb down inside the tank of a tanker with about forty other men, women and children. There they will hide during the journey over the mountains between Turkey and Greece, a trip which takes 24 hours. He has shifty eyes when I wonder how he will make a small three-year-old be quiet inside the steel tank for twenty four hours. He quietly says that it has to work, this is the only way out, because here in Damascus the money is running out, everything only gets more and more expensive. Another refugee, Mohammed, is a Sunni Muslim and was threatened to death by Mujahideen, the Islamic militia in his home district of Dora in Baghdad. He does not dare to meet us in public, so we meet in a lumber room behind a caf�Five times Mohammed has tried to escape to Europe, but has been left by the smugglers on the road between Turkey and Greece. He has had the maximum of bad luck. Three times he has been left at the border and been arrested. Twice he succeeded in passing the border, but the promised truck did not show up. No trucks came. He had been deceived by the smugglers. They had bluffed. Every time he was arrested he had to spend ten days in custody. Every time he lied, and said that he was a Palestinian. Had he said the truth, that he was an Iraqi, he would have been deported. Now Mohammed tries to earn money for yet another trip, but it is hard because the prices are increasing all the time. There is no guarantee that he will not be deceived once again, because deceiving desperate refugees has also become a business. We meet many -- both in Damascus and in Sweden -- who have been deceived by smugglers, or people claiming to be smugglers, into paying large sums of money. Mikhael finally succeeded in getting away from Syria. He has come to Athens when we manage to get hold of him the next time. He is tired and afraid. Together with 24 other men he was locked in a truck with furniture. It drove and drove and drove. For 24 hours. There was a bottle inside, in case somebody needed to pee. "The trip was very difficult. There was hardly any room in the truck, no air, and we were too many inside. It was hard, very hard. But thank God we have arrived. It was very packed. We drove across the border very easily, he had already paid the customs officer, and we were not stopped at all. We were in the truck for thirty hours. There was no air. We could not breathe." When do you think that you will arrive in Sweden? "I don't know. I am looking for a smuggler who can take me there, but it is very difficult to fly from here right now, many refugees have been caught at the airport. I think that I will go to Italy by sea. They say that if you reach Italy, it is very easy to reach other Europeans from there. I do not feel safe even though I am in Schengen, I do not have any documents, no papers." Back in Gothenburg and to the couple who made it -- Leyla and Ninip -- when they arrived they said that they would rather have died than travelling that way again. The trip was horrid. At first they flew to Istanbul in Turkey via Amman in Jordan. In Istanbul they had to wait for a long time in an apartment together with many other refugees before they continued their journey. At first they had to wade in mud up to their waists a whole night, left alone by the smugglers, and without knowing where they were. The only thing they were told was to listen for the sound of a spoon clinking against a glass -- that was the signal for them to move forward. At dawn they were met by new smugglers. Now they were to cross a river in a small rubber boat, four at a time. On the other side, a refrigerator truck for vegetables was waiting. All 42 were packed in the truck. "At first it was freezing in there, but then it got more and more suffocating, and finally it felt as if we were completely out of air! It felt as if we could not breathe during the 14 hours we were locked in, Layla says." When the refrigerated truck arrived in Athens, new men took over, and Layla and Ninip received Iraqi passports with Schengen visas, and air tickets taking them to Denmark, and then train tickets to Sweden. Leyla and Ninip's trip, just like the one Mikhael is taking, is a very typical trip for the Iraqi refugees who want to come to Sweden. But the trips are getting more and more expensive, something that Hana assures us. Her old mother is left in Iraq, and needs extra help on the way. Then it will cost 20,000 dollars, says one of the smugglers she has contacted. And how will she obtain that? "I will do anything to get her here. Anything. I can work as a slave. I do not want to reach this level, but there are women who sell their bodies," he says. 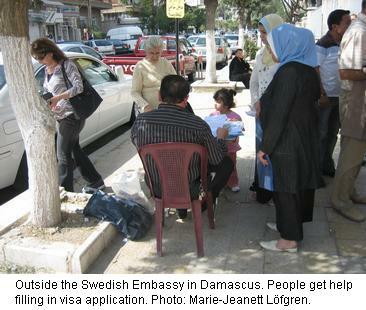 Outside the Swedish Embassy in Damascus. People get help filling in visa application. Photo: Marie-Jeanett L�en. In Damascus itself desperation is increasing. Because what can one do when one's savings are ending? And everything is getting more expensive -- the rent, the food, the medicine. People do everything in order to survive -- a women tells us that her brother sold his kidney -- and now the operation scar is infected, and she is afraid that he will die. An Iraqi we meet got the price of his trip reduced by smuggling diamonds. "I only had 6,000 dollars. He told me that it cost 12,000, but that I could get help if I brought diamonds with me to Sweden. If anything should be missing, he warned, think about your family home in Iraq. Think about their safety." We attend a trial at S�t�district court. A league is prosecuted for smuggling Iraqis to Sweden. The ring leader, an Assyrian, has been doing it for over ten years, when he was prosecuted for the first time. When he was arrested this time, he was still wearing electronic tagging from the last sentence. Another of the defendants has to report to the police regularily, but still has time to travel between Sweden and Turkey to arrange smuggling trips. These people say that they did it to be kind, to help. But the couple in Gothenburg held witness to something else. "We were treated like animals by the smugglers in Turkey and Greece, Leyla says. The smugglers were masked and had clubs which they used to abuse the men. It was not torture, but they beat them on the neck and their legs. If somebody fell, they received a beating in order to keep walking." Europol says the same thing: this is about pure profit. The smuggling to Sweden has a turnover of maybe two billion Swedish crowns this year, and the great profits together with the fact that the risk of getting caught is so small, has made the smugglers more and more in number, G� G�en at Europol says. "Yes, our estimation is that the use of criminal organizations has increased. The tougher and stricter the border controling is, the better travel documents you get, they better expertise is required in order to pass the obstacles, and that makes people use criminal networks to a greater extent to be smuggled in to the EU. We see a clear trend that people take bigger and bigger risks. Reports of bodies in the ocean are being more and more common. These organizations do this for the money, and have no scruples; a human life is not worth anything to them." The investigations that are actually being done cost enormous sums of money, several billions of crowns are not unusual, since there always are many people involved, long hours of wire-tapping, and most of it has to be translated. That is for example the case in the trial going on in Stockholm at the moment, regarding smuggling of human beings. In Iraq things are difficult. Shia are threatening sunni, who are threatening Shia Muslims. Christians are fleeing. Parents worry that their children might be abducted. Those who have worked for the Americans are being threatened. Those who have worked for Saddam are being threatened - and ones who go out for grocery shopping might be killed by accident. Mohammed, the man who has been deceived so many times, he will still try to get away again. "Yes, some day, but not right now. I will do it the same way as before, it is about luck, either I will make it, or I will get caught. Once more." And Mikhael... We only receive an automatic reply when we try to call hem. He does not answer. He has been arrested at the airport in Athens and is held in custody, waiting to probably be deported to Iraq. Footnote: Friday, October 2 2007, the verdict against the league in the Stockholm trial was delivered. The ring leader was sentenced to prison one year and seven months for serious smuggling of human beings. The sentences of the five others were lower. The human smuggling from Iraq to Sweden is based on fake travel documents. The refugees have to pass several borders on their way to Sweden and if they are caught along the way most countries send them back immediately. Fake passports are therefore a prerequisite and thus make a lucrative business. Swedish investigative radio program Kaliber discloses the spread of forgerers and their skill. Even travel documents no one thought were possible to forge turn out to pose no problems for the forgerers. We're on a street in Damascus as a man passes by with a thick bundle of passports in his hands. One and a half million Iraqis have fled the violence to end up here, in the capital of Syria. They are too many for the town to handle. Almost everyone we meet is trying to get away. Many want to go to Sweden. They know that nine out of ten Iraqi refugees who make it to Sweden are allowed to stay. But the journey is long, difficult -- and illegal. Every border must be crossed either in secret or under fake identity. If they are discovered when in a Schengen country the border guards will send them back, if the guards realize they are Iraqi refugees on their way to seek asylum. They therefore have to look like something else than Iraqi refugees. And that is why there is a huge market for fake travel documents. This is where the man in Damascus with the bundle of passports comes in. We ask the man what he is going to do with all the passports. He stops and asks where we are from. Negotiations ensue. The man wants to sell us Syrian passports, or buy one of our Swedish passports for 4 000 Dollars. Later the same evening a refugee offers us 12 000 Dollars for the same passport. It is obvious one can make big money on the desperation of the Iraqis. The trade with fake travel documents is big business. Sargon is one of the near 16 000 Iraqis who have sought asylum in Sweden this year alone. "I left Baghdad because I am Christian and a barber. The Mujahideen threatened to kill me." Sargon tells about his family's way to Sweden. It is a complicated trip and a complicated story containing lots of fake documents which Sargon bought or bribed himself to so he could flee the violence in Baghdad. He tells us he was kidnapped by one of the many militias wreaking havoc in Baghdad. He and his family are safe for the moment but Sargon is still nervous when we met him, his pregnant wife and their little son somewhere in Sweden. He tells about their first attempt to escape and that they went to Greece first, where they ran out of money. "I had no money left at all and decided to travel from Athens to Syria with a fake passport." We follow Sargon's pursuit for fake documents in order to expose how it is all handled and we will meet people who make money on the desperate flight of the Iraqis. We meet with smugglers and forgerers who tell us they are able to forge any document. And indeed, everything is forged -- ID cards, foreign passports containing Swedish stay permits and Swedish EU passports as well. Some of the forged documents are done in such a skilled way that even the police cannot figure out how it is done. We come in contact with one of the middle hands after several attempts. We make an appointment with him in one of the many caf�in Sweden that function as a meeting place for Iraqi refugees. We can call him Daniel. His position in the hierarchy is quite high, but he is still cautious. The persons he works for, the forgerers, often have connections with heavy criminals. Many Iraqis know Daniel. It is him one needs to talk with for fake documents, and he forwards the order to the forgerers. "I fix passports, driving licenses, just about whatever you need," he says. Who needs the forged documents? "People who have problems, who need to travel from different countries to another country." And that is when they contact you? "Not me, but my friends who solve most issues." Have you acted as an intermediary for forgerers? Kerstin H�ck is the Swedish Criminal Investigation Department expert on passport forgeries and she testifies to the fact that there are lots of fake documents in circulation. "It is huge, the extent of the fake Iraqi documents." So most Iraqi documents are forged? "There is a lot of forgery." We try to find out ourselves how easy it can be to get hold of fake documents. We went to another intermediary and told him we are in need of a fake identity. We were told we had to have an Iraqi driving license. With such a license one can go on and get a passport in someone else's name. "It costs 1000 Swedish kronor," says the intermediary. "Maybe three days, when do you want it? If you want it then give me a photo of yourself." 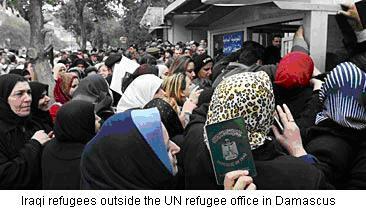 On their escape routes the refugees must cross many borders where they need many different fake documents. The quality of the forgeries depends upon the quality of the security on each check point. In order to get out of the Middle East you need an Iraqi passport with a Swedish stay permit, which is later switched for a passport or ID card from one of the EU countries who are part of the passport union called Schengen. There is no passport control in the Schengen countries. So any fake passports that are seized are not found by the passport control but by the customs, says Patrik P�son, responsible for such issues in Swedens Arlanda airport. "One might say we catch them on a daily basis in our controls." "They are often nervous, they look like they are hiding something and that is when we want to take a closer look at them." What do you usually find? "Many times they show us travel documents of varying quality, but they are not in line with who they really are." How can you see they are not authentic? "Many times the quality is poor; otherwise we take help from the police. We forward the errand directly to the police if we suspect forged documents." Kerstin H�ck from the Criminal Investigation Department says the number of forged documents from Iraqis is too much to survey -- everything is forged. "There are complete forgeries, that is passports that are authentic but belong to another person, so called look-alike passports." The refugee looks like the person on the original picture? Fred Forsberg is an ID expert at the Migration office and he shows us fake papers of different kinds. These days almost all Iraqi ID paper are forged; birth certificates, marriage certificates, death certificates, military papers, driving licenses, citizenship certificates and ID cards. How do you cope now when there is equipment for high quality printing in every store? "We look at the serial number, if the number matches with the region in which it was supposedly issued. That is why we have Swedish -- Arabic lists of numbers so we can read the serial number." Sargon is so nervous about telling us about his story his wife had to write down their story on a piece of paper for him. "In Syria I met a smuggler who told me I should travel to Sweden because everyone is allowed to stay in Sweden, on the condition I do not tell the Swedes that I was in Greece before. If they know about Greece they would send me there, because it is the first asylum country I went to. The smuggler then told me exactly what to do. My brother had to apply for a passport for me in Iraq. He then went to the Syrian border to buy a stamp showing I had traveled from Iraq and directly to Syria. This way no one could see I had ever been to Greece. The border guards asked for too much money for the stamp so my brother found instead a man in Iraq who has a Syrian stamp. It cost him 100 Dollars." In the Swedish embassy in Damascus, Syria's capital, we find Leif Ericsson, a man who sees many fake documents. He tells us what one should look for. "You see this color, it is a little bit too bright in the background. Look at the typeface, the four is closed. Here it is open." The Iraqi passports are made in different series. The first series after the fall of Saddam is called the S passports. They were far too easy to forge and are no longer accepted as valid. Now they use the more secure G passports. But during our investigation we find out that even the G passports are forged nowadays. The Swedish migration office seems to have known this but chosen not to hit the alarm button. The G passports are forged in several ways. Sometimes authentic passports are provided with fake stay permits and fake visas. And there are also complete forgeries, and the sort which is the most difficult to discover -- blank passports which are stolen. They are fake passports made with authentic but stolen passport papers. "We discover them, especially the stolen blank passports, by looking at deviations, often in the color, says Leif Ericsson. The color is slightly different. We also look at the typeface, the numbers have a wrong typeface." A smuggler in Sweden tells us there are no problems in getting hold of passports from the G series. We told him we needed help getting a relative out of Baghdad. "It is easy. I can arrange it, it is available. If he is in a lot of hurry he can pay 800 Dollars so he can get his passport very quickly." OK so he has to pay 800 Dollars to get the passport quickly? But is it an authentic passport? "Yes, it is an authentic passport, it is a G -- passport. It is no problem." Can he take a passport with another name? "Yes, yes, it is �. I know it is OK. But he has to change ID card as well, at the same time. You cannot just change passport. He needs to change ID card as well. That is an extra cost of perhaps 100-120 Dollars." So he must first apply for or buy an ID card, a fake ID card? "Yes. So he can change his name." Have you heard of someone who has done it? "Yes, yes, it is easy. It is no problem." "Yes, one of the problems concern foreign passports with Swedish stay permits and the fact that these passports can be used indefinitely despite that they are reported lost by their owners. We regrd this as a big problem." Do you have any such examples? "Yes, we have an errand in which a mother and daughter reported their Iraqi passports as lost. Their passports were then used for travels from and to Sweden during two years. And we assume it was not the daughter and mother who traveled with the passports during the two years." How do you know that someone did use his passport? "We can see that from the register at the airport, the Swedish stay permit in the passport is registered in connection with travels." But how can such a passport be used by a person other than the original owner? "Look alike passports. The passports I am talking about are perfect for someone with a similar appearance to be used for travels from and to Sweden." Yosuf testifies to the fact that there are many in Sweden who sell or give away their passports to refugees in order to facilitate their travel. He is one of the many Iraqi refugees in Sweden. He reluctantly reveals that he gave away his own passport. "It happened once that I sold my passport." "Yes, to smugglers. The money I received for the passport I used to send to my family. So they could support themselves in Iraq." Several police men confirm to us that many Swedish passports are adrift. We encounter difficulties as we try to find out exactly how many passports are adrift. We meet with Stefan Tilling, who has the prime responsibility for legal issues concerning passports at the Swedish Criminal Investigation Department. He tells us one cannot find out the number of passports. It would require weeks of special search with computers. "The number is huge and we cannot give you any definite number." Do you have any clue as to how many? "We have our suspicions; it is several hundred thousand of passports. But as I said, we cannot give you any exact number." Why don't you find out exactly how many passports are adrift? "Our computer systems are somewhat old and it stops us in our work. Each police department owns their own database. That is why it is difficult to search on a national level." But shouldn't you be interested to know how many passports it is? "Absolutely, it would be very interesting to find out and I look forward to the day we get there." But when we begin to phone around to the different police departments in Sweden we come up with a figure -- 200 000 lost passports. That means 200 000 Swedish passports adrift. These passports are still valid and can be used in other countries even if they are blocked in Sweden. This year alone 37,315 Swedish passports have been reported lost or stolen. The owners of these passports have naturally applied for new passports. In the city of Gothenburg a man has applied for twelve passports in six months. Daniel, the intermediary at the caf�knows everything about the process, how the forgeries are made. "There are many gangs working with this, but if you are looking for a really good job then you have only a few to turn to. You cannot see any difference in the passports they forge; they pass any security, everything." "Many times the forgerers are computer experts with advanced equipment," says Daniel. The police agree. The smugglers and the forgerers work mostly in networks where you buy what you need by the person who can supply it. The computers are advanced laptops kept in briefcases and exchanged between the involved persons. The passport forgeries are kept on memory sticks and handed over from one person to the other in the network. Someone has the necessary information on the identity to be produced. Someone else produces the passport or the ID card. Another one has the equipment needed; it may be a regular printer or an advanced offset printer costing hundreds of thousands of Swedish Kronor. In the final phase there is someone who does the binding and another one has the necessary stamps and holograms. "The ones making the passports make a lot of money," says Daniel. How much is a lot of money? "Between 20,000 to 25,000 kronor per passport or drivers license." "Yes, everything is possible. It is often Swedish passports because they work here in Sweden." Even the new type of Swedish passports? "Yes, it is no problem; you get the passport you order. It is no problem." Have you seen such a passport? "Yes, I had one last week." And now the police have found large amounts of forged Swedish EU passports. They belong to the series from 2003 which were described as impossible to forge. But now there is proof there are person who are experts on forging those as well and who have mastered the chemical process needed to forge these passports. The EU passports have a front cover that is made up of a series of plastic pieces melted together, each piece with its own pattern and specific information. In order to forge this kind of passports we need to separate the plastic pieces from each other and keep the pattern intact at the same time. Kerstin H�ck from Sweden's Criminal Investigative Department knows the forgerers can do this. "The forged passports are of very good quality, the surface contains the necessary patterns. They change the information inside the passport, photos, name etc. That is why they are so deceitful." The Swedish passports that are forged, are they complete forgeries or have they used an authentic passport which they later changed? "No, they are not complete forgeries; it is authentic passports which are manipulated. It is only the page containing the personal data that is manipulated in a very skilful manner." When did they start to show up? 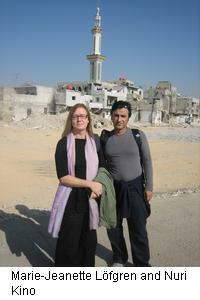 "A couple of years ago, when we started receiving many Iraqi refugees seeking asylum. The persons caught with those forged passports are almost exclusively Iraqis." There are discussions about revoking this passport series because the forgeries are done in such a perfect way and very difficult to discover. But Stefan Tilling at the Criminal Investigation Department says there are no safe passports. "The day a country issues a new type of passport the world of forgerers begins work on the new passport. This does not only happen to Sweden but to all countries, more or less. Then you have the credibility attached to the travel document itself. A Swedish passport has high credibility compared to a passport from a country which does not enjoy high credibility in border check points around the world." So a Swedish passport is hard currency for a forgerer? "It is very precious, yes." As long as people need to leave Iraq and as long as that is not doable in a legal way, the market for fake travel documents will prosper. Sargon is one of those who have bought almost every kind of forged travel documents in the hope of bringing his family to safety. "I bought forged passports for 1300 Dollars each and then Greek stay permits that cost 400 Dollars each. I took the forged passports and went to the airport where we paid for help to pass the check points. We made it and flew to Sweden." But despite all efforts, all the money he spent, all loans, everything he sold and sacrificed for the forged passports and the fact that nine out of ten Iraqis seeking asylum in Sweden are allowed to stay; he and his family are not allowed to stay. The first thing which takes place in the Swedish migration office is the taking of finger prints -- and comparing them with the databases of finger prints which all Schengen countries have access to. And that is when they found out about Sargon's finger print which was taken during that first escape attempt -- to Greece. That is why Sargon and his pregnant wife and their little son must go back to Iraq. Sweden gives asylum to 90% of the Iraqi refugees.